QR Game Plan mobile device business intelligence allows for teams and venues, players and agents, to engage with fans and sponsors in real-time during live games and events for customized promotions timing and embedded consumer analytics. The company is the brainchild of Founder and Chief strategist, Maurine E. Karabatsos. She developed, implemented and introduced QSites™ and QRGamePlan.com to the marketplace. She was kind enough to speak to the Sports Techie blog and community today about their QR sports business technology that compiles big data and pristine analytics for targeted markets, while enabling major sports teams to time their sponsors RTA’s (Real Time Ads) to game day play. Currently QR Game Plan is the top QR Code marketing and branding company specialization software technology for revenue enhancement in the sports and entertainment industries. Their platform offers clients the ability to set up their own QR Campaign with specifically designed timing mechanisms and customized promotions. “At QR Game Plan, we believe it’s about revenue generation for the teams and venues and a way for them to focus on their sponsors,” stated Karabatsos. During MLB Spring Training they have been servicing the defending World Series champions, the San Francisco Giants, and the Cactus League in Arizona. They are transforming how teams and venues capture and cultivate their fan bases on a seat-by-seat and precision timed basis. In total they have nine patented mobile templates. Direct promotional offers are tailored and distributed to a specific audience within seconds. Once the ad has reached and resonated with the fan, teams and sponsors are provided with instant feedback that aids in the targeting process. A QR, or Quick Response Code, is a specifically generated 2D barcode that stores over 7,000 characters, and can be read or decoded with any web enabled Smartphone. It enables your smartphone to scan the code and read the information. Sports Techie, use this link to download a QR Code reader. Maurine shared two stories about what inspired her to launch the company. The first involved a ticket manager for the Phoenix Suns luxury seats three years ago. She was curious if they knew who attended the games for each suite over a 41 game home schedule. The Suns at that time did not have this data collected and analyzed for their bottom line benefit. The second story involved the codes in toy catalogs. She wondered if she could construct a tool that could identify when a market say in Minneapolis, Florida and Kansas City, was hot or cold, and move product accordingly, just like in the different areas of a stadium. Their proprietary tech uses privately branded and hosted QSites™ as a useful tool for strategic marketing and branding of advertisers/sponsors/corporate partners to fans. QRGameplan’s technology based tools and knowledge help clients maximize their marketing efforts and dollars by gathering data and tracking traffic. With their solution you can adapt marketing objective in real-time because of the embedded consumer analytics. “You will not find these analytics in a search,” stated Maurine. This innovative technology allows teams to sell more active sponsorships by offering affordable sponsorship levels to local businesses that otherwise couldn’t afford it. High level sponsors are delivered robust and analytics driven sponsorship level opportunities to connect with luxury suites. AMEX can use the tech to target suit holders with a tailor made gold card offer while simultaneously offering the green card to the rest of the arena. It updates every two minutes. In that time you could offer a 2-for-1 hot dog deal to section 305 and then change that to a free large drink for the prize of a small coupon only 120 seconds later to a venue restaurant. Why do businesses run traditional media ads if they don’t know how many people are actually looking at them? QRGameplan software helps users track and capture data that shows if they are spending their time and money with satisfactory ROI. As a result, they have no competition and are “ahead of the curve,” said Maurine. Timing is a critical component of activation. The success of special offers like halftime promotions or free swag giveaways for certain groups hinges on proper timing which this solution delivers in real-time. Their programmer is a sports techie guy who understood the dynamics of designing software architecture that could handle the complexities of having game times that begin on EST and PST, depending on where you are. Video is a key functionality. Connecting to your social networks is simple to do with QR Game Plan. This week they sent individual tweets to this year’s members of the SBJ top 40 under 40 list. Maurine was excited that StubHub retweeted their social media effort at https://twitter.com/QRGamePlan. A baseball inning can fly by in a few pitches but football or basketball quarters or soccer periods can take more time on average enabling better timing and execution of preplanned promotions. Local merchants can target demographic groups in the stadium and speak to them via their smartphones and tablets. In fact, if you try to use a PC the screen will appear fuzzy. As a result, campaigns will not end up in an email spam box either because of the mobile device only delivery. This is truly mobile only sports technology. QR Game Plan is setting the standard in QR Marketing Software. The real magic is how the software is designed to pull apart a stadium and produce data that targets areas, groups or seats. This platform was designed with the intention to be scalable. Sponsors have new unique opportunities to reach the fans with QR Game Plan. Additional revenue models that been created include game promotions, dynamic pricing models and a referral service. Maurine explained their localization strategy regarding Spanish by saying that 3-4 years ago MLB.com would have a page or two in Spanish and then it would roll back to English. Now MLBAM has complete web sites in my Sports Techie mom’s native language. Response codes can be in Spanish for advertisers who want this option. When fans walk around the stadium they have more activation opportunities resulting in additional revenue models created for vendors and local merchants that QR Game Plan is prepared to maximize for their customers. Direct activation opportunities abound such as the scorecard, the kid’s playground or placing a banner somewhere in the stadium. Golf courses can run a survey during the 18th hole that is a bounce back advertising opportunity for golfers to get a coupon that gives them a free nine holes on a given Tuesday, or a bucket of range balls. A golf pro or agent can operate with private QSites and rep their vendors, move product and support charities. It can be used for any sport, or other industries like grocery store chains or Alaska tour groups on cruise ships. Concerts are another good customer fit. Venues, teams, players, and agents have enjoyed success attracting sponsors of meet the player events because of QR Game Plan. I asked Maurine what other sports they are targeting and she said, “Hockey, and we are not in the NFL yet.” We discussed gamification and she commented about their ‘Hot Corner,’ or scan the hot corner baseball trivia. It changes every three minutes giving it gaming qualities. I added back to her that this is an area I could see her software focusing on for future business development opportunities. The cost for the mobile templates is on a per game basis. There is a license per season. If there is a pre-season it is included as a bonus. There is also a minimal setup fee. Each site is custom built by the QR Game Plan team to look and feel like the sports team or venue, which gives attendees the feeling that they are still within the brand of the company. They work individually and confidentially with each client to help set up specific, targeted campaigns so that their clients use their marketing dollars effectively and with impact. Sports Techie, Maurine shared a fun example of how this tool could work with the Ketchup, Mustard and Relish races at games. That made me think about how this could work for Seattle Mariners games at Safeco Field here in Seattle in-between innings when they run an animated hydroplane race where fans select which of the three boat colors will win. “Stadiums and teams have become sophisticated,” said Maurine. She said the Giants added $5 million to AT&T Park this offseason to improve its wireless connectivity throughout the ballpark. Stadium interactivity is at any all-time high thanks to the explosion of connected fans and mobile devices, Jumbotrons and stadium monitors. You want stats, thus far during spring training 2013 they have worked 13 games, seen data on 65 different cities and 1,500 visitors, who spent an average of 4.5 minutes inside the environment. “We have the roster of every team in MLB pre-loaded before each game, including Japan’s last week during the WBC 2013,” said Maurine with a ton of enthusiasm. Maurine’s invention is now part of the game experience. 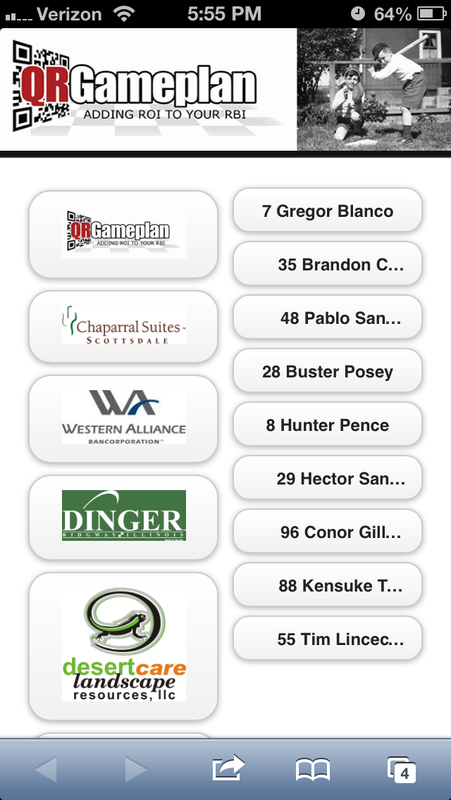 The score card has always been a token saver, now they have the QR scan codes in the lineup card complete with corporate sponsors to save as well. If you are a Chevy or Kia dealership, a NCAA venue, or a local vendor who wants to reach targeted fans and gather intelligence in a new way, QR Game Plan, is your way to success.